Custom Rugs are a key service from Ascend Rugs NZ. This custom rug was made for a hunting lodge in Canada used by high profile visitors including Bill and Hillary Clinton. 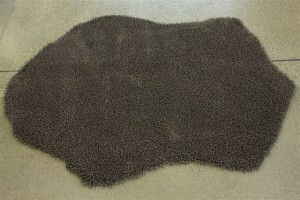 This Natural Yeti Twist rug uses naturally colored wool in a twist yarn – Black / Brown / Fawn. No bears were harmed in them making of this rug!